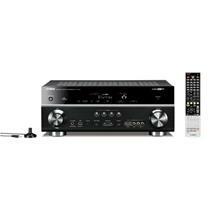 Yamaha's RX-V receiver line shipped in May, save the top of the line RX-V871 which is finally available now. The RX-V871 does the things that the lower end receivers do - as you might expect. It handles DLNA streaming as well as streaming music from services like Pandora, Rhapsody and Napster. It also offers a front USB port for iPod and iPhone playback. Both devices can be controlled by the receivers remote and on screen guide. Yamaha's RX-V871 separates itself from the rest of the line by offering up a second subwoofer output which brings it to 7.2 channels. It also kicks up the output from 90 watts per channel to 100 watts per channel. It also boasts a total of 8 HDMI inputs and a pair of outputs with audio return channels. You can pick up the RX-V871 now at a price of $899.